1. All Genesis II grills feature their newest infinity ignition, with improvements made to the push button, to the wiring, and to the sparking devices. The result is an ignition system that is now warranted for 5 years! 2. Redesigned stainless steel burner tubes that are easier to clean and generate a more consistent flame. The new shape means that moisture and grease from the cooking environment will NOT settle around the burner openings and cause clogs or corrosion. 3. The new Flavorizer bars improve heat distribution and create a more evenly heated cooking surface. The small cuts in the bars also allow you to view when your burners are been lit… no more guessing here. 4. 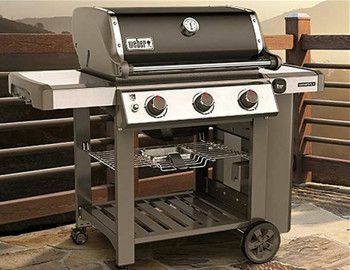 The improved grease management system means that less grease accumulates under the grill. Plus the grease tray is easier to clean thanks to the open cabinet design. If you have ever wanted to monitor your grill from the convenience of your phone, you now can thanks to the iGrill3 from Weber (sold separately). Simply hook up the meat probe(s) to what you are cooking, and clip another probe to the cooking surface and now you can keep tabs on your grill from anywhere in the house. Great for slow cooking ribs or pork shoulder, even better for those Thanksgiving day turkeys!